As CBD becomes more popular than ever as a viable medical choice, more and more CBD companies are popping out of the ground like daisies. And as a consumer, it can be difficult to find a trustworthy company that produces truly effective CBD products. cbdMD are hoping to achieve that reputation. Their clinical approach to medicinal CBD evokes both a professionalism and a seriousness for the subject. With a wide range of different products, it would be difficult to find a method of consuming CBD that you didn’t like – whether that’s delicious orange flavored vape oil, or CBD cream specifically designed for inflammation. Unfortunately there is no ‘About Us’ page on cbdMD’s website, so it’s impossible to get a true gage of who created the company and when. However, you don’t have to spend long on their website before their ethos becomes strikingly clear. This is a company focused on spreading vital information about many health-related topics. They have plenty of accessible articles on the website, that talk about different neurological conditions, physical setbacks, diseases, and even cancer. This mass of information supports their strong belief in CBD’s ability to transform the lives of many people suffering from any of these issues. Even the website itself, with its blue and white geometric design, inspires images of a doctor’s surgery. The question is, how well do they operate as a CBD website? Medicinal information: As mentioned before, the website offers a mass amount of information about different medical conditions. Besides being very informative, it gives us an insight into how they approach and view the potential of CBD. Returns: The company seem very gracious about accepting returns if the customer is unhappy with their product. They give you 30 days to decide whether you want the item or not and plenty of ways to contact them if you have an issue with either shipping or the product itself. Free shipping: It’s always a bonus when a company offers free shipping. But more than that, it shows their appreciation of the customer and it means you can save a bit of money! CO2 Extraction: The company are passionate about creating the most effective oil possible. To do this they have invested in sophisticated and powerful machinery to extract CBD with the CO2 method. This ensures that the oil contains as many cannabinoids as possible. One of the issues on the website was that it took a long time to find the ‘lab reports’ for cbdMD’s products. And even then, the result was one certificate of analysis that appeared to be very vague. It would be great if, like many companies do, they had a ‘Lab Results’ subheading on their main page, so customers can find it relatively quickly. They do assure us that all the products are tested through an independent, third-party company. I guess we will have to take their word for it. Sleep has never come easy to me, even when I was a child. And as many fellow insomniacs know, it can make you feel like you are constantly in a losing battle with yourself. That’s why I try to always keep my eye out for possible solutions to sleep, and that includes CBD. When I saw cbdMD’s Sleep Aid Oil, I thought it could be a possible match-made in heaven, as not many CBD companies sell an oil specifically designed for sleep. I was really pleased that they made the flavor minty, although the taste was a little artificial at first. On a positive note, the oil really helped settle my mind and I felt much more relaxed than I had the previous few nights. And while I didn’t drift off immediately, it was much quicker than a regular night. All in all, I was pleased with the product and would definitely use it again. We already know that cbdMD have gone the extra mile for their customers by producing a large variety of products to suit a large variety of problems. We are going to look, in detail, at some of their most popular ranges. If you prefer to consume CBD in the traditional way, then cbdMD stock a range of CBD tinctures. What’s not so traditional is the exciting array of flavors that the website advertises. Buyers have the option of consuming Natural, Mint, Orange, and Berry flavored oil. This is ideal if you find the natural taste of CBD too earthy and bitter – which many people do! You can also find a variety of strengths on the site, including; 300mg, 750mg, 1500mg, 3000mg, 5000mg and 7500mg. They stock some incredibly potent oils, which makes the brand a great medicinal choice for those feeling the heavy burden of certain conditions and ailments. Calling all vapers for a delicious dose of CBD! Vaping can be a convenient and hassle-free way to absorb CBD quickly into your bloodstream, but truth be told the best thing about vaping are the tasty flavors you can experience. On cbdMD, they sell 3 different flavors; Vanilla, Mint and Orange. All the flavors come in varying potencies of 300mg, 750mg and 1500mg. Interestingly, they also sell vape liquids for a secondary brand, ‘Mingo Rad’, and their flavors are a little more extensive; Sugar Cane, Mocha AF, Coco Key, Electric Razz and Melon H2O. Whether you are suffering from a skin condition such as, eczema or your muscles are constantly sore from the gym – topicals are the perfect CBD solution. 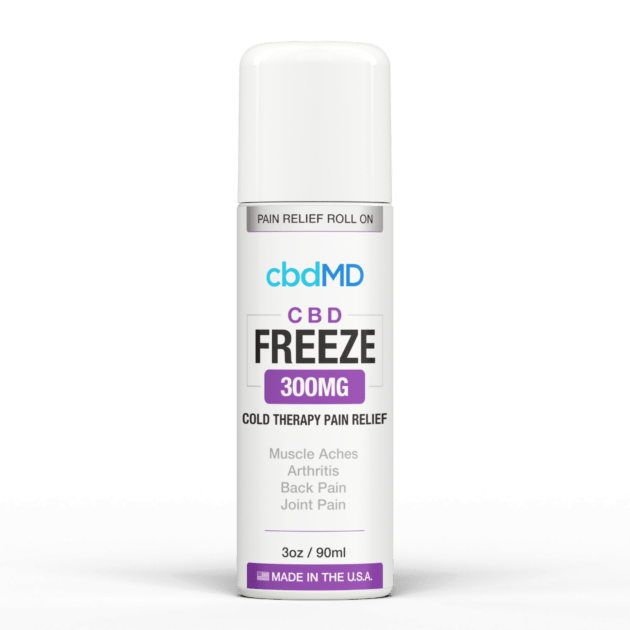 On cbdMD’s website they are currently selling two types of topical product, the Inflammation Formula range and the CBD Freeze range. Both sell at the same potencies of 300mg, 750mg and 1500mg. The main difference is that the Inflammation Formula boasts high concentrations of vitamin B6, Arnica and MSM – all ingredients that help arthritic damage and increase flexibility within the cellular walls. This means it should help you recover from inflammation quicker than with your average CBD oil. What’s great about cbdMD’s CBD pet range is that it differentiates between different animals. Often, we find that companies sell generic CBD oils for all pets, but cbdMD make specific oils for dogs, cats and horses – all with their own individual flavor to make it easier for your pet to consume. And because it’s important to match CBD potency with the size of an animal, the website sell appropriate potencies for each animal too. Perhaps we have a few dog lovers at cbdMD, as they sell an additional product for dogs, which are their CBD dog treats. They are flavored with peanut butter and sound pretty tasty for your pooch. At first glance, this company appears to be an enigma. We don’t have access to much information about their history or a strong sense of ethos. But luckily, the website speaks for itself and represents a strong championship to some of the more serious medical conditions that might be aided by CBD. It’s wide range of products, for both humans and animals means you’ll be able to find a method of CBD that suits you. And whether you are after information about conditions that CBD may be able to help with, or are looking for a company that takes its oil quality seriously, cbdMD may be the company you have been looking for.